HDMI Switch, 4X1 HDMI Switch, HDMI 2.0 Switch manufacturer / supplier in China, offering 4*1 HDMI 2.0 Switch with 4K@60Hz Hdr, Bluetooth 5.0 Wireless Earbuds with Auto-Charging Box, Mini VGA to HDMI Upscaler 1080P and so on. 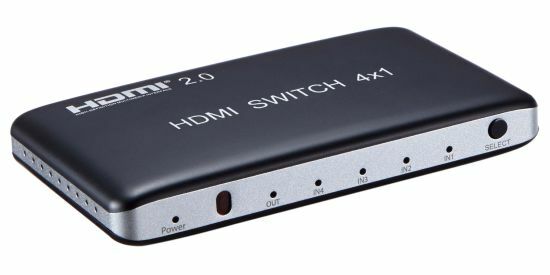 The 4x1 HDMI 2.0 switch allows 4 HDMI ports to be switched to a single display terminal via remote control or buttons on unit. 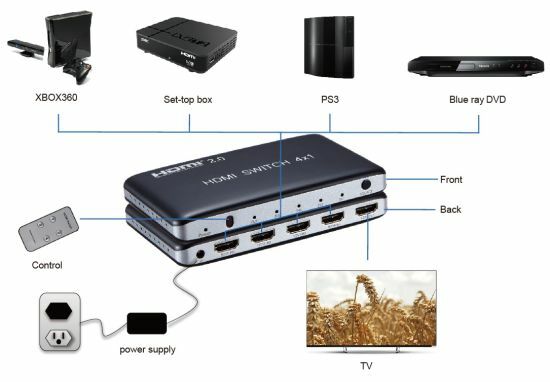 The switcher can be placed at the end of a long HDMI cable to regenerate the HDMI signal.The HDMI switcher can support all hd formats including 720p, 1080i, 1080p, 4K/30Hz,4K/60Hz multichannel audio. and Satellite Receivers, HD players, PS4, Set top Boxes. 1: Connect four cables from HDMI source device into HDMI switch input. 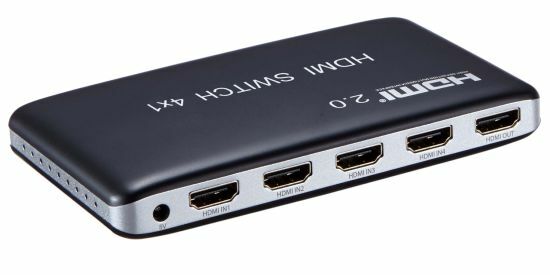 2: Connect one cable from HDMI source device into HDMI switch output. 3: Connect 5V/1A power adapter to the HDMI switch .